I just realized that I have not shared a foldable with you since June! Yikes! 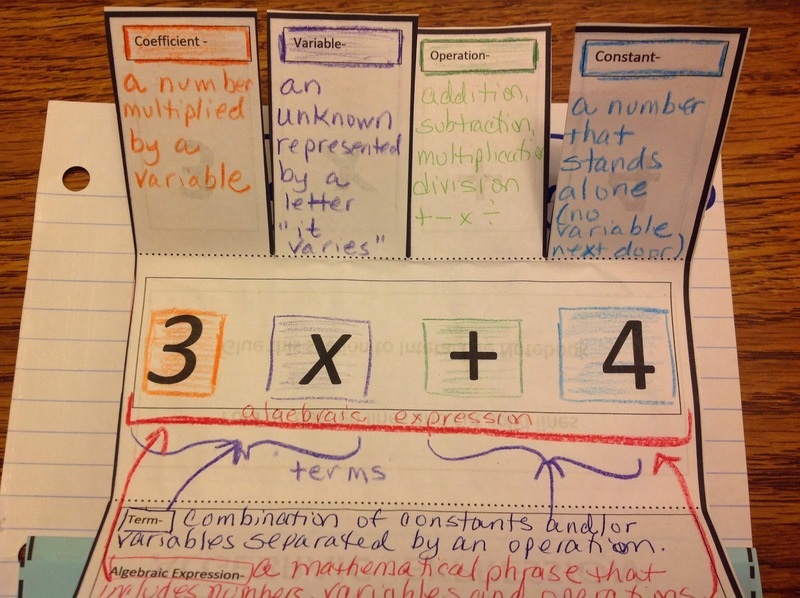 So here is a foldable I made for algebraic expressions. One day I saw a worksheet somewhere, I can't remember where, that had coefficient, variables, terms, constants, operation and algebraic expression definitions all together. After seeing that worksheet I knew that it I wanted to make it into a foldable. You have no idea how many different foldables I worked on before I finally finished one that I liked. In my Interactive Notebook I've placed it next to my most used graphic organizer. 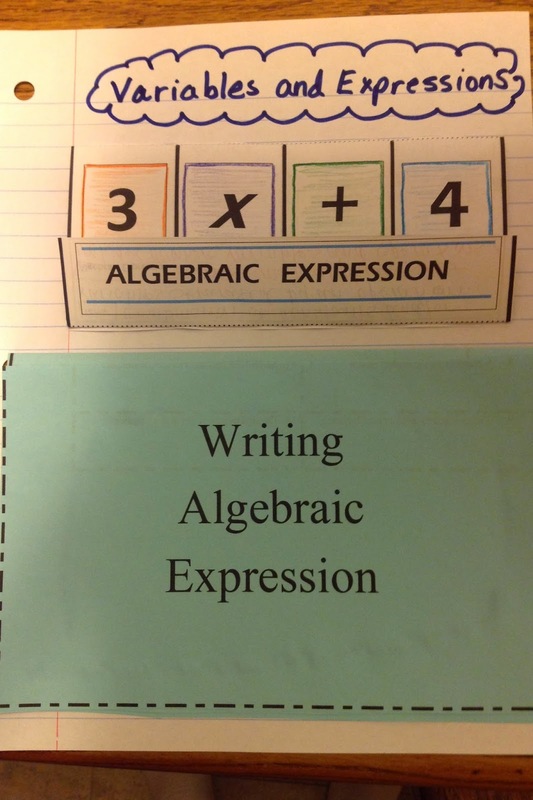 This will give students a quick reference when writing algebraic expressions from words. I like the matchbook foldables because the flaps don't end up flipping over. There are also some practice problems. Yes I know it should say algebraic expressions (plural). I changed it on the sheet you can download. When you pull down the flap there are definitions for term and algebraic expressions. When you open up the next flaps I placed arrows to show the section that is a term and that the entire problem is an algebraic expression. I liked color coding the different vocabulary words to give an added visual for students. 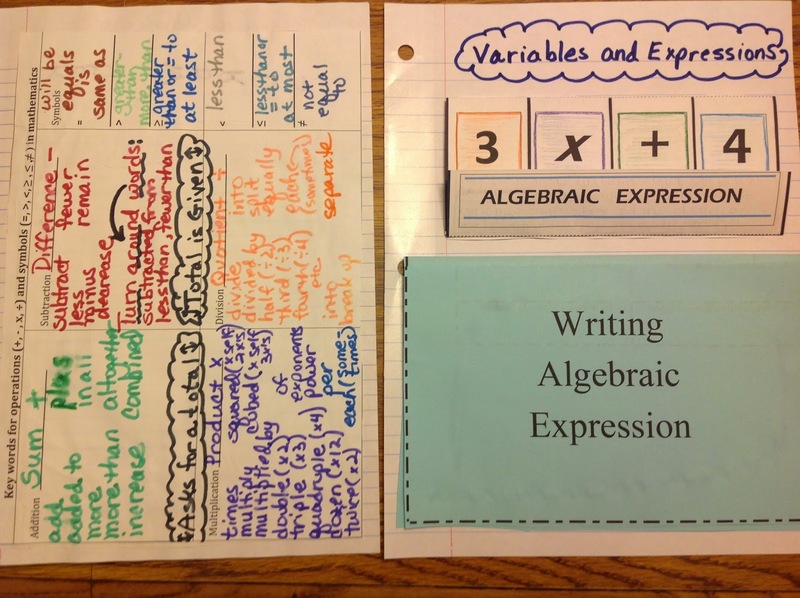 Click here for a copy of the algebraic expressions foldable and writing algebraic expressions practice sheets. 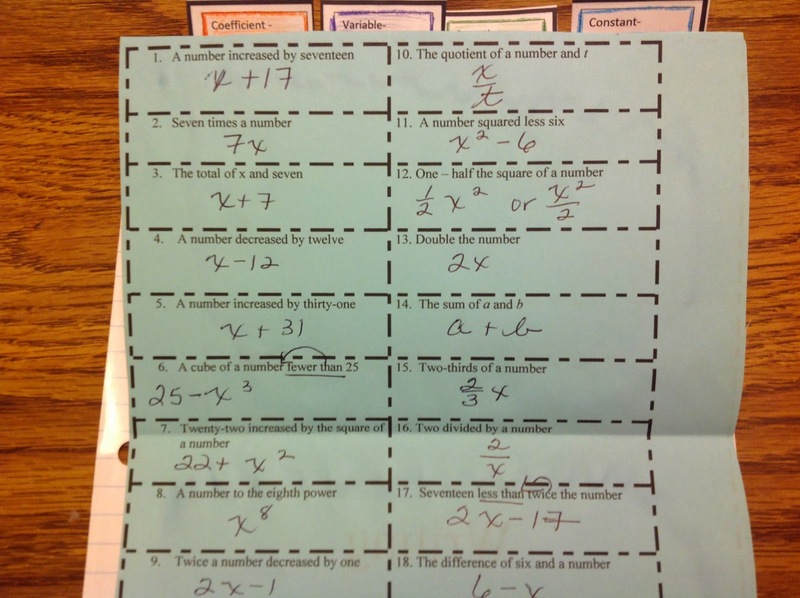 I will use this foldable for my Algebra and Pre-Algebra classes this year. Last year I did Interactive Notebooks only with my pre-algebra classes. This year I plan to start using them in Algebra as well. I'm excited about that. The summer has flown by. I start school next week and on Friday for our in-service we are having our first Kagan strategies training. I can't wait. Look forward to a post next week with reflections about the training. I'm LOVING this foldable. Thanks for sharing! Thanks Christine. I love foldables for a study tool as well. I don't think I can ever go back to regular notes again. I am so excited to be a new follower! 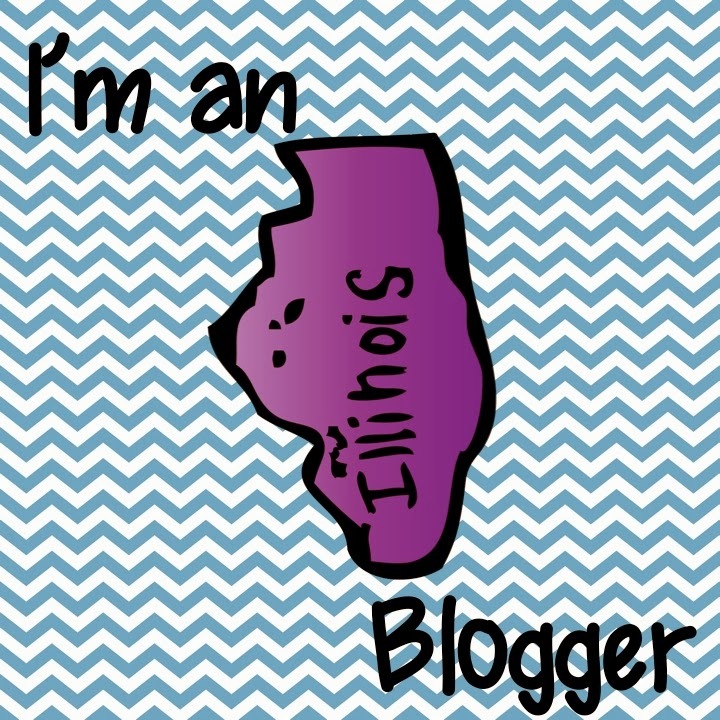 Please make sure to stop by my blog and follow me! 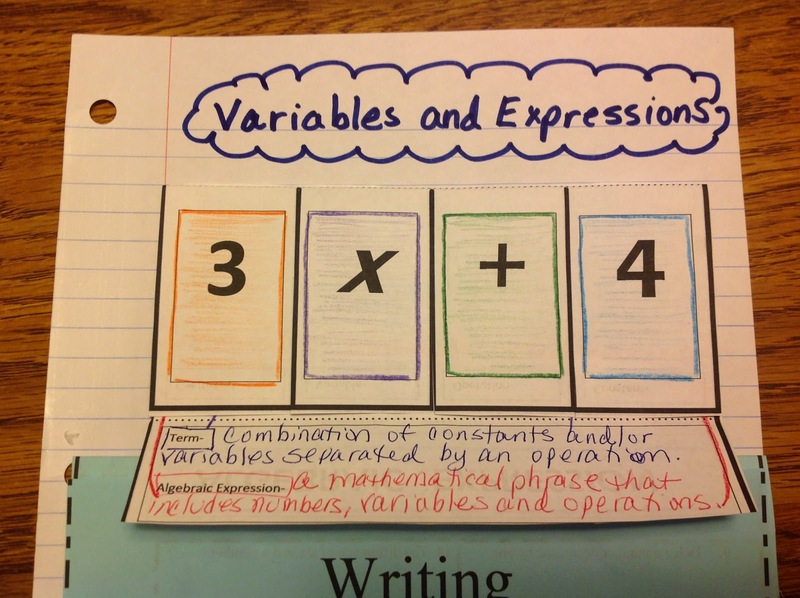 I absolutely love all your math ideas for interactive notebooks. I plan on starting mine this year and document how it goes. I am super excited!! I will check your blog today. I'm glad you found me. You will absolutely love the interactive notebooks. Can't wait to see your posts throughout the year! This is mine! Where did you get it from? No, I made this myself years ago. Jan, love your foldable. My name is Lorraine Lichtenberger, and I too teach 8th grade math. I'm always looking for new ideas and potential long lost relatives. Thanks so much Lorraine. Wow, what are the chances of another Lichtenberger teaching 8th grade math! I'm sure we are related somewhere down the line. Enjoy your year and thanks for taking time to leave a comment. I love this! I just used it in my 6th grade class. I liked your definition of a number that is alone. We said it has no friends. But a coefficient has a variable friend. Your writing looks exactly like my mom's writing. Are you left handed? Oy vay I liked your definition of a constant as a number that is alone.